A SATCOM Series of exceptionally low phase noise synthesizers offer an economical solution for lab and SATCOM up and downlink testing. 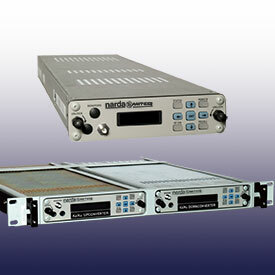 Two standard models are available, IF L-band covering from 950 to 2150 MHz and RF Ka-band covering from 27.5 to 31 GHz. The SATCOM Series has a standard 1 kHz step size, with optional full-band fast switching available. The field-tested design and low power dissipation proves to demonstrate higher MTBF and higher reliability. These synthesizers are available in half-rack mounted chassis with front panel control and serial or parallel control through rear panel connectors. 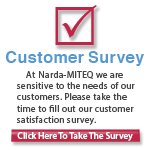 see L3 Narda-MITEQ catalog C-38B "Frequency Generation Products".